Does The Perfect Pharmacist Candidate Exist? As an employer, you want knowledgeable members of staff to help drive your business forward. You want a vast amount of experience to ensure that your pharmacy remains profitable and to represent you in every perceivable setting. You want someone to be chatty, but not so chatty as to become a distraction. Someone who’s enthusiastic, but won’t become a threat to other senior members of staff. You may want someone who’s flexible with their approach to work, while also being process driven and eager to work within defined parameters. You may not have the budget to attract all of the traits that you want, meaning that you’ll need to flexible with regards to those who you hire into your business. 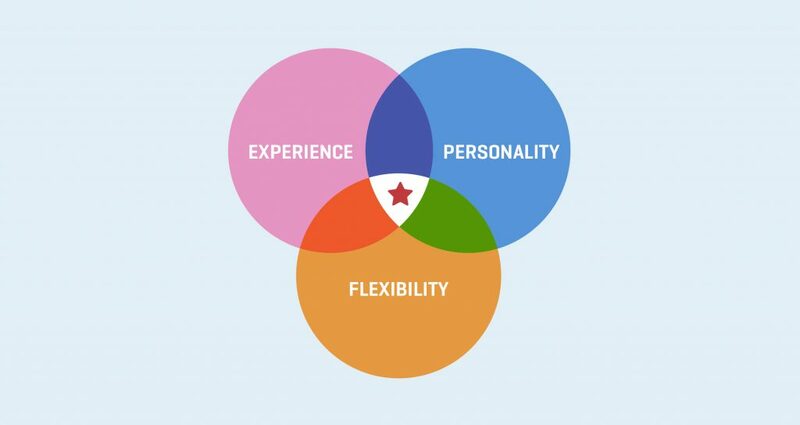 So, let’s have a look at the three main traits that we experience from our applicants on a daily basis. The Venn Diagram below gives you an indication of the rarity of the perfect pharmacist candidate. There are many pharmacists out there who prides themselves on CPD. They were generally high achievers in school and are determined to ensure that the number of certificates in their study keeps increasing. Numbers, processes, data and conformity give this person a sense of achievement. In the pharmacy sector, that sounds perfect. However, this type of person may leave your organisation in pursuit of their personal goals. We often discover that they have had lots of employers on their CV and they usually cite ‘personal ambition’ as the reason for moving around. Their process driven outlook may mean that they are inflexible with regards to changes in working patterns and may oppose change within an organisation. Personal aspiration is great, as is someone who is process driven, but those qualities do not define that person and hiring managers often require more flexibility and a team-based mentality when employing members of staff. Flexible pharmacists will generally complete CPD either by gaining practical experience as they develop within the work setting but they may not be eager to undertake further studies. What a flexible pharmacist can offer is the ability to fit into a variety of teams and the ability to adapt to surroundings. Flexible pharmacists are perfect locums, they embrace variety and are willing to operate within new and innovative processes. I know what you may be thinking, ‘these guys are a bit flaky and we need someone who’s process driven.’ We’ve heard that from clients before. If you hire the flexible pharmacist, they could bring innovation to your site and they could inspire others around them. However, if you’re a hiring manager who is more comfortable with traditional thinking, you’ll want someone more like yourself. You want the experienced pharmacist who is process driven. There are some things that we can’t measure. We know how many prescriptions go out, we know our turnover and we know how many patients we see. But how does this happen? Why do people come to your pharmacy instead of your competitor’s? A lot could be down to your staff and how they interact with your patients. You can’t train someone to have a ‘bedside’ manner and you can’t train enthusiasm. However, just because someone has a great demeanour with patients, doesn’t mean that they’re giving the correct information. Experience is vital in our industry. Mind you, you can train people to follow processes and you can teach people new skills. You can’t teach a personality. The Venn Diagram above offers a great representation of the ratio of candidates that we speak to, in relation to their most prominent traits. We speak to lots of people who fit uniquely into each trait. Fewer who encompass two traits, and even fewer who display all three. Hence the star in the centre. That’s our goal. We want to introduce you to candidates who demonstrate all three traits, the perfect pharmacist. Our ability to find you the perfect pharmacist relies on you being honest with us with regards to what you need and being realistic about budgets. As with much in life, you’ll attract the quality that you’re willing to pay for. If you want to speak to our expert pharmacist recruiter, Thomas, please get in touch on 07746625940 or send an email to thomas@locatealocum.com We’ll get back to asap and get the ball rolling to find you the perfect pharmacist candidate! We’ll find you a star!